electrical pins, drive shaft for focus. 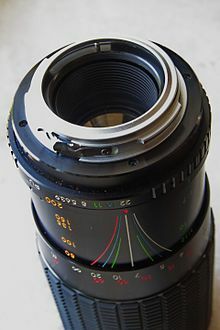 K-mount lenses can be used on all Pentax bodies, but are restricted to stopped down mode when used with "crippled" KAF-mount bodies (see below). Pentax ME F and SMC Pentax-AF 35-70/2.8, the only products using the KF-mount. The KF-mount was Pentax's first attempt at an autofocus system. This autofocus system used sensors in the camera body and a motor in the lens. The two were connected via five new electrical contacts on the bayonet mount itself. One permitted the lens to turn on the camera's metering and focus sensors, two focused the lens (towards and away from infinity) and two appear to have been unused and may have been reserved for future functionality. The KF-mount was largely a failure. Only one camera and one lens ever used this mount, the Pentax ME F and SMC Pentax-AF 35-70/2.8. The lens was somewhat large and cumbersome since it had to enclose both the focusing motor (with gears) and batteries to power it. KF and the ME-F are similar in many ways to the system used by Canon in the ill-fated Canon T80, introduced several years later. The ME F can use all Pentax K-mount lenses which feature an aperture ring. The 35–70 mm lens can be used on all other Pentax K-mount bodies in manual focus mode, but it must be used stopped down on "crippled" KAF bodies. The KAF-mount was Pentax's second and much improved attempt at adding auto-focus to lenses. It adds a small drive shaft to the KA-mount, allowing the body to adjust the focus of the lens. This makes the lenses less bulky than the earlier KF-mount, which had both a motor and batteries inside the lens. It also adds a seventh electrical contact, this one carrying digital information from the lens to the camera. It carries the following information: focal length, distance to the subject, exact absolute f-stop value, and lens size. This information is used to make better exposure decisions, along with the multi-segmented metering that was introduced in cameras using the KAF-mount. The MZ-30/ZX-30, MZ-50/ZX-50, MZ-60/ZX-60, the *ist series and the K100D/K110D lack the mechanical stop-down coupler/indicator. In these cameras – in aperture priority mode – the aperture is set by a dial on the camera body, and no longer on the lens. Pre-A lenses can only be used in manual stop down metering mode and manual flash mode. The KAF2-mount is the same as the KAF-mount except that it adds two extra power contacts to the inside of the mounting ring and transmits modulation transfer function (MTF) data through the digital seventh contact. The power contacts were originally used for power zooming. Since the introduction of the K10D digital SLR model, they are mainly used for powering Silent Drive Motor and DC motor lenses. The K10D/K100D Super and later cameras do not have a mechanical stop-down coupler/indicator and thus can only use stop-down metering on pre-A lenses. The KA2 is identical to KAF, but lacks the autofocus drive shaft. Another way of looking at it is that it adds the seventh contact for digital information to the KA-mount. The KAF3-mount is used on Pentax lenses that solely rely on SDM or DC autofocus motors. It is identical to the KAF2, but lacks the screw-drive autofocus drive shaft. Another way of looking at it is that it adds the power zoom/in-lens autofocus motor contacts to the KA2 mount. The KAF4-mount was introduced in June 2016 with the HD Pentax-DA 55-300mm F4.5-6.3 ED PLM WR RE lens. It is identical with KAF3, apart from the missing aperture control lever. Instead, aperture control information is transmitted digitally through the data pin and the aperture is stopped down through a motor built into the lens. It also introduced a new type of autofocus motor, designated PLM or Pulse Motor. At the time of its introduction, the following Pentax DSLR bodies were compatible with the new mount: K-70, K-50, K-S2, K-S1, K-1, K-3 II, with all but the K-70 requiring a firmware update. Also after a recent firmware update the original K3 can use the new mount. 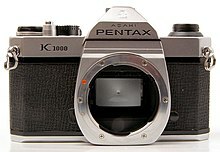 All digital K-mount Pentax SLR bodies as well as some lower-end film cameras lack the ability to read the position of the aperture simulator. This means that lenses that lack the lens information contacts introduced with the KA-mount (Pentax K- and M-series lenses as well as some third-party products) do not support open-aperture metering on these bodies. Instead, stop-down metering must be carried out by pushing the “green button” on the camera before taking a shot. This variation of the mount is commonly referred to as the “crippled“ K-mount. The R-K-mount is a variation on the original K-mount by Ricoh. It supports Ricoh's own implementation of shutter priority and auto exposure modes, similar to the KA-mount but much simpler. The only addition to the original K-mount is a small pin, commonly dubbed Ricoh pin, at the bottom which tells the body when the aperture ring has been set to the "P" setting (similar to the "A" setting on Pentax KA lenses). The 'P' setting is not compatible with the 'A' setting as the 'P' pin is in a different location than the 'A' contact on Pentax 'A' lenses and the flange on Pentax bodies. The R-K-mount is used on Rikenon P lenses, Ricoh bodies that include the letter 'P' in their model number, and some non-Ricoh lenses. It is compatible with all other K-mount cameras and lenses when in manual or aperture-priority exposure modes, however the extra pin needs to be removed for safe use on autofocus Pentax cameras, as it can otherwise become locked within the autofocus shaft. Lenses locked to the camera body this way are difficult to remove and may require complete dismantling. Adaptors can be found to allow use of lenses with Leica M39 thread (screw) mount. If a lens originally intended for Leica Rangefinder cameras is used, focusing is limited to about 10 cm. However, some SLR lenses were made in LTM 39 mount, mostly by KMZ for use in the early Zenit SLRs which had LT 39 mounts. These "Zenit" TM 39 lenses will focus properly. Or these lenses can be used in conjunction with the M42 to LTM 39 adapter. Adaptors can be found to allow use of a non-Leica 39 mm mount into the K-mount, typically as a M39-M42 adapter ring that is mounted in a M42-PK adapter; they may focus to infinity. Pentax supplies adapters to fit M42 screw-mount lenses, as do several third-party manufacturers. The M42 screw-mount system was used by Pentax prior to the introduction of the K-mount. Pentax designed the K-mount wide enough to allow an adapter to fit between the M42 thread and the K bayonet. They also kept the same flange focal distance (also called registration distance or register) as the M42 screw-mount, so that M42 lenses focus correctly using the correct adapter (such as Pentax original or Bower). There are however other third-party adapters that add to the flange focal distance so that one loses the ability to focus to infinity. The loss of infinity-focus may not be significant in macro or close-up photography. There is great debate in the Pentax community over the applicability and safety of adapters other than those supplied by Pentax. Many users[who?] of third-party infinity-focus adapters, such as Bowers, report difficulty in removing the adapters from camera bodies. Such adapters may require modification before they may be safely used. Official Pentax adapters, and flanged non-infinity-focus adapters, do not provoke such problems. Many old M42 lenses have a modern-day cult reputation, including the (Pentax) Asahi Takumar range. Some manufacturers, including Carl Zeiss AG, still make lenses in the M42-mount. K-mount cameras have a suitable flange focal distance (45.46 mm) to adapt old M42 lenses without any optical correction or loss of infinity focus/changed close focus distance. Other SLRs with a short flange-focal distance can accept M42 lenses as well: Canon E-mount (44.00 mm), Sony and (Konica) Minolta A-mount (44.50 mm), Sigma (44 mm), Olympus 4/3rd (38.67 mm), and many more, but notably not Nikon F-mount (46.5 mm). Optically corrected adapter to use Nikon AIS AI lenses on K-mount. Adapter for Voigtländer Bessamatic and Voigtländer Ultramatic lenses, Kodak Retina Reflex, or Kodak Retina IIIs lenses. There is also some Petri adapter to K-mount but those do not allow to focus to infinity due to the different flange-to-film-plane distance. Pentax made adapters for its medium-format lenses to use on the K-mount, both the 645 and 6×7, and for the Hasselblad Bayonet type. Also there is a Pentacon-Six (Kiev88 CM) adapter still in production and a shift adapter to use Pentacon lenses as shift lens. Mounts used for Telescopes, microscopes and generic optics. The T-mount was initially developed by Tamron (1957) to allow the easy adaption of generic 35 mm SLR optics into multiple mounts. The T-mount is a 42 mm diameter 0.75 mm pitch screw mount with a 55 mm flange focal distance. Later versions (T2, T4, TX) were more advanced and complex. Several other manufacturers besides Tamron have used these mounts. Because the T-mount is still used for many telescopes and microscopes, they are still available new. Note that while both T-mount and M42-mount are 42mm screw mount systems, and will mount if they are forced, they are not compatible. The difference in pitch can cause damage to the lens, adapter or camera mount if they are confused. These are adaptors designed by Tamron to allow the transfer of aperture setting from lens to camera or vice verse, including the Adapt-A-matic (1969), Adaptall (1973) and Adaptall-2 (1979). When Pentax introduced the KA-mount in 1983 Tamron upgraded their Adaptall-2 K-mount into an Adaptall-2 KA-mount. For more details see the Tamron article or the Adaptall-2 web site. A lot of Sears cameras were made by Ricoh or Chinon and use the Pentax K-mount. Some are simply rebadged models, while others are quite different. Angenieux a lens manufacturer in France, mainly known for its movie equipment than for photographic lenses, but it has built optics for Leica, Nikon, Canon and a few K-mount lenses. The Agfa K mount cameras were rebadged Chinons. Arsat is a trade mark of Ukrainian lens manufacturer Arsenal, Kiev. Beroflex seems to have been a German commercial firm of photographic lenses; not too much information is available yet but it appears that it designed lenses made overseas by Japanese companies like Soligor. Beroflex 500 mm f8/f22 lens, 5° view ; 72 mm diameter × 42 mm. Adapter fitted for use on M42 screw thread. In 1975 came complete with lens caps and case. Carl Braun Camera-Werk of Nuremberg, Germany, or Braun, as it was more commonly called, was founded as an optical production house. It is best known for its 35mm film cameras named Paxette, and for slide projectors named Paximat. Carl Zeiss of East Germany marketed a number of lenses for the K-mount through its sales network. These lenses were in fact made by Sigma in Japan. The "real" 35 mm East German made Carl Zeiss Jena Lenses were available at the same time but only in Praktica B-mount. Cosmicar is a division of Pentax, it commercialized video lenses, but some were released for the K-mount. CPC Lenses are also known as Phase 2 or Phase 2 CCT. Gemini 1:4.5 80-200mm Macro MC Zoom 55 (55mm filter thread size). Hanimex was an Australian distributor founded by Jack Hannes after the Second World War. The name is a contraction of HANnes IMport and EXport and the company imported both European and Japanese lenses, bodies and accessories. Hannes apparently sought low cost providers and Hanimex lenses have a poor reputation among users. Hoya, a leading manufacturer of optical glass, purchased Pentax in 2008. Kalimar was an American distributor of camera equipment from 1952 to 1999 when it was acquired by Tiffen, information on lenses and manufacturers is difficult to obtain as it sell rebadged cameras and lenses from the former Soviet Union and Japan and sell it under its own name in the United States. Volna 50 mm f1.8, kit lens for Almaz-103 kamera. Luxon is a Chinese manufacturer, and there is little information available on the company or its products. Miranda was a brand name used by the Dixons group in the UK, mostly for Cosina made products. Makinon lenses were made by Makina Optical in Japan. Makinon MC 135mm 1:2.8 (55 mm filter) not to be confused with the macro version. Superb sharpness wide open. Petri 40 mm f2.5 "Pancake"
Good sources of information on Pentax K-mount lenses: Bojidar Dimitrov's Pentax K-mount pages, Stans Pentax Photography site, Pentax Forum's lens reviews. Bold text indicates lenses in current production/stock sale from Pentax. Polar is a brand of Samyang Optics, a South Korean third party lens manufacturer. This lens uses the Ricoh KR-mount version, Ricoh made both a XR version without the zoom pin, and the P version which has it. Sakar is a commercial American company that used to sell K-mount lenses. Samyang is an optical manufacturer located in South Korea. Many of their lenses are also sold under the Rokinon and Bower brand names. All these lenses had been marketed by Samsung and present on Samsung's GX-series DSLRs. Schneider-Kreuznach is a traditional optics maker that do still make specialised glass and lenses (today mainly high-quality large-format lenses, enlarger lens and photographic loupes), but not for Samsung. They license their name to Samsung granted that certain minimum quality requirements are fulfilled. All the Schneider branded glass from Samsung is manufactured by Pentax and corresponds directly to Pentax lenses. The Schneider-Kreuznach lenses feature shift and tilt movements for perspective control; they can be shifted by 12 mm and tilted by 8 degrees simultaneously. Sears is an American commercial company that sells relabeled lenses and cameras at their own stores in the United States for a number of years. As the objective was mainly commercial, quality is very different among lenses. Quality on construction in some ones is very good and in some others is plain bad. But it seems to be consistent among the same model. Some of the Sears lenses were made to fit Sears Cameras with the Ricoh K-mount version and are identified as KR, but is prudent to verify it before using it on more modern cameras that may be damaged by the Ricoh pin. Sigma is a Japanese manufacturer of cameras and lenses. It has made lenses for the K-mount for a number of years. And quality among them had varied a lot. After the launch of the K10D digital SLR it launched K-mount D series lenses. Such ones are designed to be used with the APS size camera, but older K-mount can be used as well. An increase in model numbers can be seen between 2007 and 2008 due to the success of the K10D, K100D, K100D Super, K110D, K20D and K200D cameras. Use of older Sigma lenses is possible but with caution, some Sigma older K-mount lenses are with the infamous Ricoh pin. Spiratone was a company devoted to sell photographic accessories and manage to sell some lenses under their own brand name until it closed, very few were made for the K-mount, and none of them are known to be of good quality. Tou Five Star was the commercial brand from Toyo Optics; some lenses are labeled as Toyo Optics, Toyo Five Star or Tou Five Star. They were manufactured between 1967 and sometime around 1980, when the company seems to have changed its focus to video lenses. Zenitar is a Russian lens brand, made by KMZ. Most Zenitar lenses are also available in M42-mount. Some of these are sold as K-mount lenses but use an adapter. ^ "Bojidar Dimitrov's Pentax K-mount page". Retrieved 2007-09-30. ^ a b c d e "The Evolution of the Pentax K-mount – Technical Information and a Little Bit of History". pentaxforums.com. 29 December 2014. Retrieved 14 June 2016. ^ GA, MEM-TEK, Ellijay,. "Tamron Adaptall-2 lenses - Adaptall-2.com". www.adaptall-2.com. Retrieved 22 April 2018. ^ "Samsung Digital Camera". Samsung Techwin (subsidiary of Samsung Group). April 4, 2008. Retrieved 2008-04-05. ^ "US Patent 4,174,167". US Patent and Trademark Office. November 13, 1979. ^ Paul Burrows (5 October 2012). "The Australian Way". AV Hub. ^ "Kalimar Acquisition by Tiffen with some history". unknown. February 3, 2000. Retrieved 2008-09-17. ^ "General Reference to kiron Lenses on MFLenses". MFLenses. September 17, 2008. Archived from the original on 2008-04-18. Retrieved 2008-09-16. ^ "Bojidar Dimitrov's Homepage". www.bdimitrov.de. Retrieved 22 April 2018. ^ Halpin, Stan. "Stan's Pentax Photography". stans-photography.info. Retrieved 22 April 2018. ^ "Pentax Lenses - Pentax Lens Reviews & Lens Database". www.pentaxforums.com. Retrieved 22 April 2018. ^ "HOME - RICOH IMAGING". www.pentax.jp. Retrieved 22 April 2018. ^ Ricoh, Dr. "The Unofficial Guide to Ricoh SLR Cameras and Rikenon Lenses". www.drricoh.de. Retrieved 22 April 2018. ^ Sakar Current Corporate website Sakar Corp.
^ Resource, The Imaging. "NEWS! - Samsung rebadges Pentax DSLR". www.imaging-resource.com. Retrieved 22 April 2018. ^ "Lens Test: Schneider-Kreuznach D-Xenon 18-55mm f/3.5-5.6 AF". popphoto.com. Retrieved 22 April 2018. ^ Roberts, Mark. "Vivitar 70-210 Series 1 Macro Zoom Lenses - Mark Roberts Photography". www.robertstech.com. Retrieved 22 April 2018. ^ Keng. "ZENITcamera: Объективы Красногорского завода". www.zenitcamera.com. Retrieved 22 April 2018. Wikimedia Commons has media related to K-mount.